Focus on Buyer and Merchant NeedsRipple’s is mostly focused on bank settlements, while Graft provide solutions to buyers and merchants. Buyers can pay anywhere with cryptocurrencies or plastic card using Graft wallet app. Merchants can receive payment from anyone using point of sale accepting both cryptocurrencies and plastic cards. Faster payment confirmations are provided by Graft supernode authorization sample, a process that is more similar to Dash masternode scheme. Unlike Dash masternode, however, Graft supernode is not a “wrapper” or a second tier as it is designed to be a monolithic code base that implements both real time authorization and blockchain settlement (mining) features. Such an architecture improves security of the real time authorization process, as payments cannot be settled “off supernode chain” by the “lower” level blockchain network nodes, without supernodes knowing about their existence. Thus, all Graft transactions are authorized instantly without requiring additional fee, by supernodes that are automatically selected by the network using combined proof of work and proof of stake algorithm. Focus on Absolute Privacy Ripple consensus protocol is different, and its main problem is that it does not provide privacy features: untraceability and unlinkability of payment transactions. Unlike Graft blockchain, all transaction information on the Ripple ledger is public. Ripple does not provide the privacy and untraceability that are demanded today by potential Graft users – both buyers and merchants. When we pay with credit card, we share our secret payment information (like credit card number) with some entities – the merchant, the issuing bank, the payment processor, the payment acquiring bank – but those entities are relatively trustable so they try not to share our secrets with the entire world, and no one else can see our transaction history without our or their permission. Oftentimes, however, they fail to keep our secrets (think Target and many other retail mega breaches). With Ripple or Bitcoin or most other cryptocurrencies that are not based on CryptoNote protocol, the story is exactly opposite: there is no central authority that “knows” our secret “card number” (private key), but at the same time anyone in the world can trace our payments on the blockchain and link them to our identities with minimum efforts. 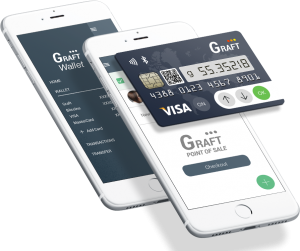 By Implementing CryptoNote and other features, Graft brings the level of untraceability of payment history similar to traditional credit and debit card system, while adding decentralization, privacy, and security, which are the features of any cryptocurrency that are absolutely impossible to achieve using traditional credit card payment technology. Previous PostPrevious Since Graft uses CryptoNote protocol, has the Monero community indicated support for Graft? Next PostNext GRAFT Pre-SALE is ON!